Want cool desktop stats? -> Conky! Have you ever wanted to have awesome looking stats on that rest on your desktop and don’t interfere with your work flow? If so, you’ll probably love this nifty little application. Example of a basic Conky setup. Its called Conky and it can give you stats or information on practically anything imaginable. Its also easy to install! Typically when you install an application such as this, you want it to auto-start. Auto-starting this application isn’t as trivial as most applications so I’ll walk you through that as well. I’ll assume your using Ubuntu of some sort, but if you’re not don’t worry…you can still install Conky with alternative steps and setting it up should not differ. 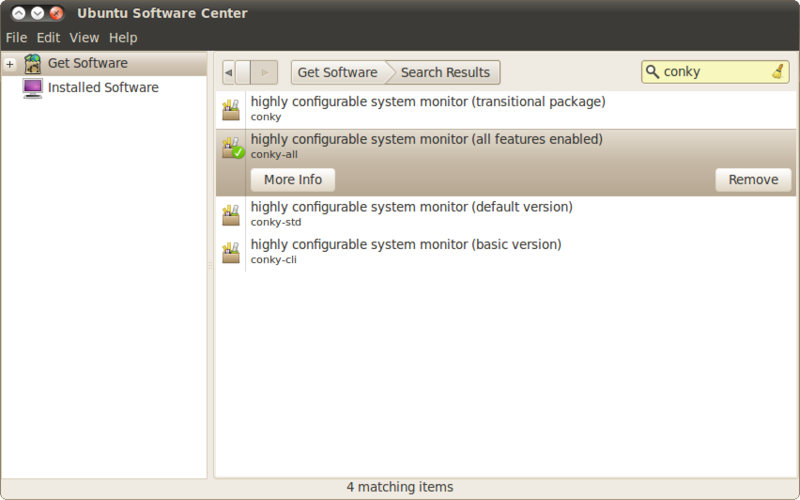 Open the “Ubuntu Software Center” application (also known as “Add/Remove” in older versions) and search for Conky. If its not listed then you may need to find a package online. 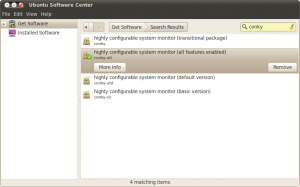 Find and install the Conky option entitled something along these lines: “highly configurable system monitor (all features enabled)“. Create a file labeled “.conkyrc” in your home directory (usually saved as /home/username/.conkyrc) and make sure to include the period at the start. This will make the conky settings file hidden when you casually open your home folder so its not in your way. You may need to go to View -> Show Hidden Files or press Ctrl+H to view the file to edit it later. 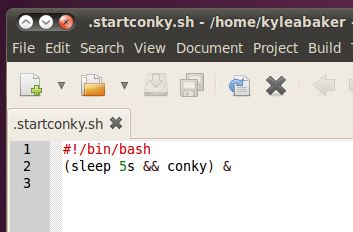 Open the “.conkyrc” file in a text editor of your choice. Paste the linked snippet into your “.conkyrc” file. Create a file labeled “.startconky.sh” in the same folder as the previous file making sure to include the period at the beginning and the file type at the end. Save both files and close the file editor you were using. Now right-click on the “.startconky.sh” file and click Properties and select the Properties tab. Make sure you check the option to “Allow executing file as program” then click close. Click Save! Now the next time your restart your computer you’ll have some awesome stats that appear on your desktop! I’ve never seen the point of these kind of status applications. Why would you need anything like this on a desktop machine? I understand the need for a server or development machine. But what is the use for anyone doing normal operations? During the lifetime of the application, it would probably just consume more resources than it would help you shave off when you are running your machine at max. Just because you don’t use an application doesn’t mean its useful or liked by others! Laptop users should be careful. If you make a bad configuration Conky tends to eat battery.